Feeling tied town by fat work responsibilities so much that you forget you are only human. The tips they don't tell you during orientation. Feel too busy to exercise in your off time and desk work got you sitting all day? There are many people going to work everyday that feel this way. 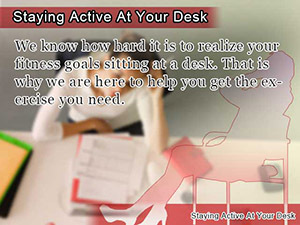 Lack of exercise and chills related to poor blood circulation can often be associated with the nature of desk work. There are many people that would agree that since starting their desk job they have put on weight. This is why as you work in the office, it is recommended that above what you usually do it's important to move around every once in a while to promote better blood circulation. Let's look at what remedies there are to keep you off and on your seat throughout the day while preventing you from gaining weight. After sitting down in a chair, it's a common reflex to start to cross your legs. For some of use this might be the only we are able to settle down. However, as you cross your legs, veins in your pelvic area start to compress causing poor circulation in your feet. You may have experienced this before after sitting crossed legged for an elongated period, and sat wondering what hurt worst, your foot as the blood rushed through it regaining circulation or barely making it to the restroom in time. You may be thinking that crossing your feet is okay as long as it is done with alteration. This may work for some people; but it is best that you make avoiding this you number one priority. Crossing your legs makes you fat? Crossing you legs puts stain on your body as well as your pelvic area. It is said that the chills, stiff shoulders, lower-back pain, constipation, edema, lowered metabolism, and core spinal deformity affecting your bodyline and posture can all be attributed to the strain caused by crossing you legs, which can potentially lead to unwanted weight gains. To keep from gaining weight, it's essential that you develop measures against straining you pelvic area. By doing this, it enables you to improve your lower body circulation, helping you get rid of undesired swelling in your legs cause by edema. From time to time, the air conditioning in your office may drive the room temperature down to a point where you should consider putting on a sweater. There are a lot of woman in this case feeling chilly having their body temperature drop below normal. Although you might already be bringing in your cardigan or a lap blanket to keep you warm throughout the day, it's still easy to forget keep the areas of your body that shouldn't be allowed to get cold, such as your neck, abdomen, and ankles, warm the way they should be. When the areas along your neck, abdomen, and ankles, where large blood vessels and bare skin are located, is cooled down, your bodies blood circulation is negatively effect potentially leading to the cooling down of your body as a whole. Even in the case that you warm other areas of your body, exposing these three key areas makes it difficult to warm up your body. In order to keep these areas safe, it is recommended that you take a scarf, stomach warmer, socks, or leg warms to work just in case things get chilly. This way you neck, abdomen, or ankles don't get left out in the cold, keeping the rest of your body warm and sitting pretty. As you cool down, your body becomes more likely to retain fluids and store away fat, making it easy to develop unwanted cellulite over time. In addition to having to deal with cellulite, your body's metabolism takes a hit because it isn't able to get rid of waist and toxin like it is use to. This is why keeping your body warm in the right places is the best defense against setting up your body for conditions that make it easy to put on weight. On a hot summer day, it's easy to get the feeling you deserve a cold beverage, such as a smoothie or large fountain drink, which often contains as much as ice as the drink itself. As refreshing as it sounds, this exposes your body to cold, which as explained previously can be hazardous to your health if you let it get carried away. The abdomen, as noted previously, is an area that you should avoid exposing to cold. By drinking to much cold beverages, you are bound to experience a chill in your body, which creates amongst other things, unnecessary work for it to do trying to warm you up. This is why it is recommended that you drink something above room temperature if all possible. Just because something is said to contain zero calories does mean its okay to send chills down your body, making it easy to gain weight and harder to lose it. So, along with considering the amount of calories in your drink, take interest in its temperature as well. Warm you body with power of ginger! Ginger has the known effect of improving blood circulation, which in turn warms your body. Just by adding a little to each cup of coffee or tea you drink each day can help rid you of edema, boost your metabolism, and battle the chills. In addition, with ginger tubes you can take it with you to work and get the effects anywhere. Accompanied with desk-work, it is easy to get stuck in the same position for long periods of time, potentially leading to poor blood circulation. Along with poor blood circulation, make people are faced with edema causing unnecessary fluid retention and water weight to be stored in the lower half of your body. In addition, poor blood circulation impairs you metabolism making it harder to burn off fat and easy to get fat. This is why it is recommended that you stay active even while working. Sitting back-strait against the back of your chair raise your feet creating a horizontal line with you knees. Hold for 3-5 seconds until slowly returning your foot to its original position, then alternate. Do this 5 times per foot. Do this exercise slowly, imagining a stretch from your thighs to the tip of your toes. Try doing this exercise isolating you lower body while maintaining good posture. Not only does this exercise help promote better blood circulation and prevent problems with edema, is serves as a sure method to tighten of worry areas such as the area around your thighs and calves. There are many people that have the experience that when even comes, so does swelling in their legs. The best way to deal with this sort of swelling is right away. That is why the best defense again edema and its swelling is easy to attain and can be done at home by just taking a bath. You may be thinking why is it you can't get the same effect by taking a shower. Taking a shower doesn't help you raise your core body temperature, which promotes better blood circulation and allows excess fluids to leave your body, as much as taking a bath does. Prevent unwanted cellulite from developing by taking care of it in the early stages of swelling, edema. While soaking in the tub, promoting better blood circulation, gently massaging your body increases the effectiveness of your treatment. In addition to blood circulation, massaging at this point is also said to promote the flow of lymph and boost your metabolism. It's recommended that you use the massage oil or cream that fits your taste, for an enhanced relaxation effect. Stability ball exercise helps you sit straighter in the chair as well as being a great way to burn fat and ease back pain. Get back into exercise on balance balls. What are some leg swelling causes that can be avoided? Get a head start against swelling in your legs. Watch out for inactivity, poor diets, and weight gain. We know how hard it is to realize your fitness goals sitting at a desk. That is why we are here to help you get the exercise you need. Find out why - AC, open windows, cold beverages are find at giving you the feeling of cooling of on a scorching day, but should be avoided. 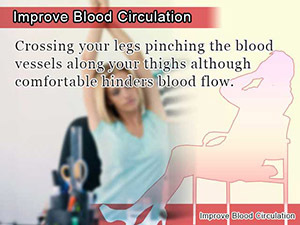 Crossing your legs pinching the blood vessels along your thighs although comfortable hinders blood flow.